Electrical conductivity (EC) can be used to compare the relative overall nutrient concentrations of different brands of otherwise similar types of nutrients. 2-parts: 5ml of part ‘A’ + 5ml of part ‘B’. 3-parts: Collect a total of 10ml from all 3 bottles in accordance with the ratio of parts used to achieve a given formulation type. For example, 10ml of ‘bloom’ formulation may be comprised of 4ml part ‘A’ + 4ml part ‘B’ + 2ml part ‘C’. Typically, the strongest 2 & 3-parts yield between 2.4 and 3.0mS. 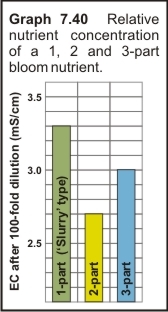 Comparable, “slurry” type 1-part’s can far exceed 3.0mS - see Graph 7.40. *For accuracy, use a finely graded pipette (or equivalent device) for measuring out the nutrient. Note: This method does contain a degree of error because the conductivity of different mineral salts varies (See “Effect of salt type”).